The Angeles National Forest is part of the broad swath of mountains known as the San Gabriels and features a wide mix outdoor activities from hiking and rock climbing to biking to backpacking. How you choose to play in your backyard is up to you, but you might want to start with these High Country Hikes from the US Forest Service. Santa Anita Wash, San Gabriel Mtns. The San Gabriel Mountains and Angeles National Forest are arguably Los Angeles' most overlooked backyard playground. That's not to say they are ignored, however. With over 2 million visitors a year, this transverse range plays host to a lot of people seeking escape from the city, but many of those visits are border visits, meaning most people only enjoy those activities or places that are located on the edges of the forest close to the freeways of southern California. But there is far more to the San Gabriels and the Angeles National Forest than a striking view from you car as you zip by on the 210. As you press deeper into the interior of the range the crowds drop off dramatically and the opportunities to enjoy a bit of secluded wilderness increase. Fragrant pine forests, lush canopies of alder and live oak, waterfalls and secret swimming holes await the intrepid hiker eager to spend a few hours exploring the woods. Different seasons can have dramatic effects on the same trail creating a completely different experience on each visit. 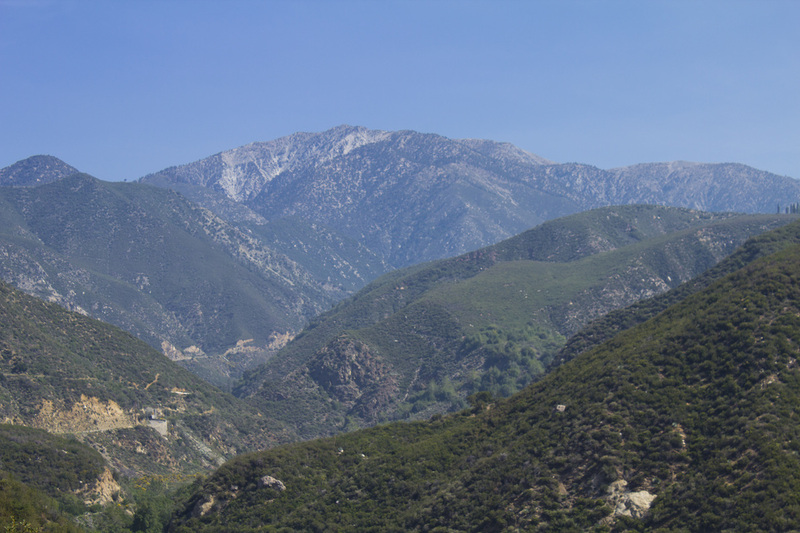 The San Gabriels are also about the closest area to do some backpacking if you want to spend the night in the wilderness. For long hikers, the Pacific Crest Trail traverses the length of the mountains and into the San Bernadinos. In addition, skiers and snowboarders can zip the slopes of Mt. Baldy and Mountain High in the winter, while mountain bikers can get their 'pedal' on in the summer. And canyoneering exists throughout the year. Of course not everyone wants to go to such extremes or has the time necessary to venture further into the mountains. But not to worry, there are plenty of places to go and things to see that are a closer drive to home; you just may have to deal with more people depending on when you visit. Hike-LosAngeles will start you off with simpler hikes with interesting features close-by, and as time goes on we'll add more adventurous options a little further out. For most Angeleno's, access to the San Gabriels will come from either the 210 freeway running along the southern slopes or from the 2, aka the Angeles Crest Highway, which bisects the range. Wherever you begin your odyssey you will find a different landscape than the coastal chaparral of the Verdugos, Griffith Park or the Santa Monica Mountains. Chaparral does exist where there are large open areas, but here you will more likely find broadleaf forestation at the lower elevations with riparian habitats of alder, cottonwood and willow thriving along stream courses and watersheds. As you make your way up the slopes this dense canopy gives way to the finer needles of conifer trees. Springs, sag ponds and wetland areas found in the Rift Zone are a result of seismic activity along the San Andreas Fault. And the naturally occurring waterfalls throughout the range are fed from snow melt at the higher elevations. The tallest point within the range is Mt. San Antonio, known locally as Mt. Baldy, at 10,064'. If you feel up to it, there is an annual 7-mile run to the top of Mt. Baldy (link below) or you can take a more leisurely hike when there isn't quite so much pressure. As with most hiking in the area, you will possibly encounter mule deer, coyotes, opossums, skunks, racoons and, if you're lucky enough to spot one, bobcats. This is also mountain lion country. Although they tend to keep to themselves, it is recommended you keep an eye out in the early morning and late afternoon hours when the big cats tend to prowl for prey, especially if you are in the back country. Bears can also be about and are particularly aggressive if they have young cubs. The main thing to remember is if you don't bother them, they most likely won't bother you. As a final note, parking for most trips inside the San Gabriels will require an Adventure Pass from the National Forest Service. Passes are $5/day or $30/year per car. If you plan on doing much hiking in the area, the yearly pass is the way to go. Passes can be purchased at National Forest offices, ranger stations, online and at select local merchants. A list of sellers closest to the location you plan on visiting can be found here. 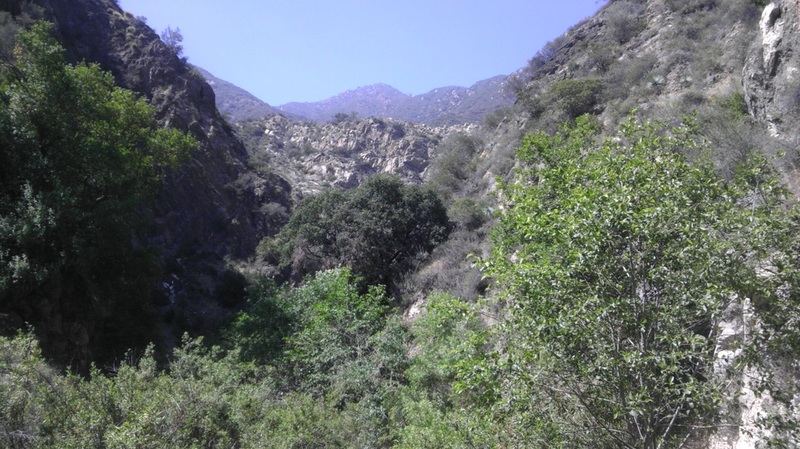 SAN GABRIEL TRAILS - Click the green buttons below for hike details. 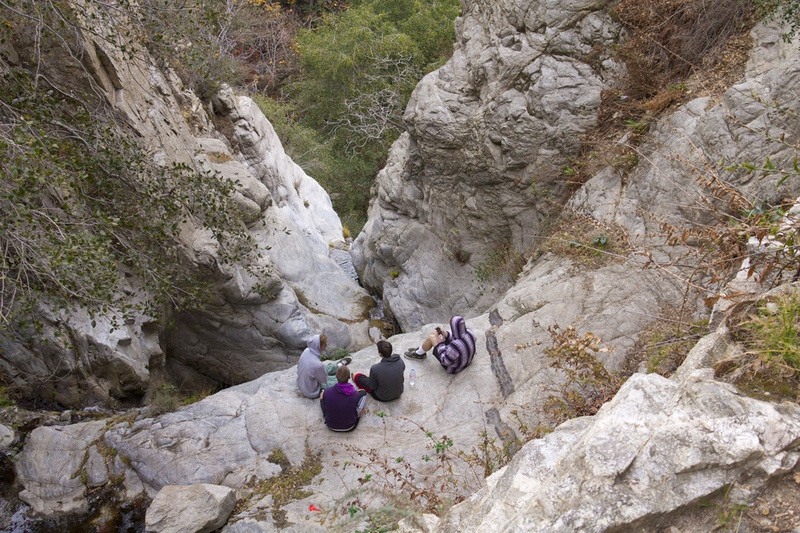 Situated in the Eaton Canyon Natural Area, this family-friendly trail winds for just under 2 miles through 190 acres of natural landscape that can cause you to forget there is a teeming city just over of the canyon walls. The flat trail is mostly wide fire road until the last .5 or so when it becomes a single-track path crisscrossing the Eaton Wash, culminating in the 40' tall Eaton Falls. 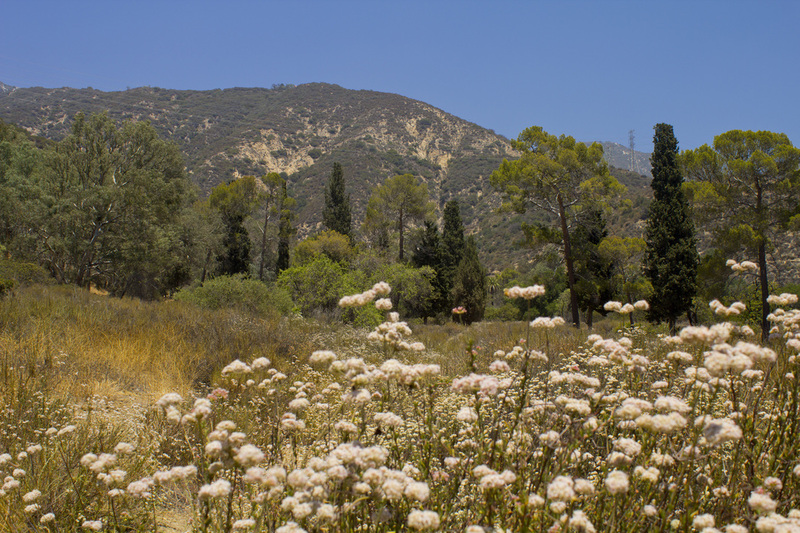 The Eaton Canyon Nature Center at the trailhead provides opportunities to learn more about the natural wilderness that surrounds Los Angeles. 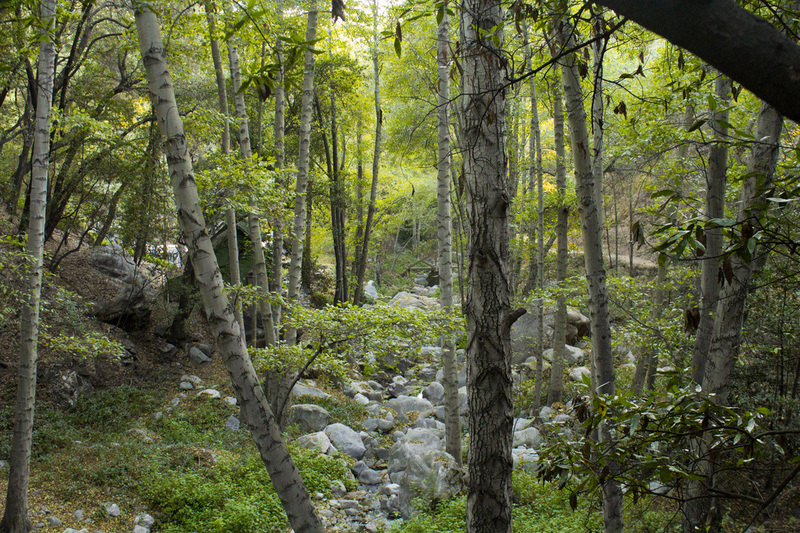 The trail to Sturtevant Falls is a throwback to an earlier California with many rustic cabins nestled along the banks of the Santa Anita Wash. After an initial sun-drenched descent into Big Santa Anita Canyon, you will meander leisurely under a heavy canopy of Alder and Live Oak, passing a number of man-made water features until you reach the 50' high Sturtevant Falls. The trail does include several water crossings which may be treacherous during heavy water flows, but for most of the year are crossed easily. Late winter and spring are the best times to view the falls, but fall and early winter avoid the large crowds of summer guests and cabin residents. 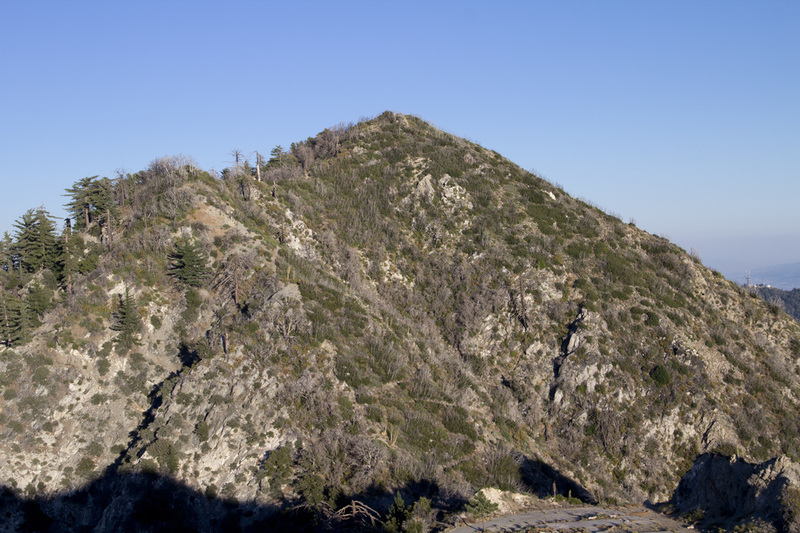 It's not just the tallest peak in the San Gabriel's, Mount Baldy is the highest peak in all of Los Angeles County, making it the must have mountain for Angelino Peakbaggers. But snagging that peak isn't easy. Mount Baldy, or Mount San Antonio as it is more properly known, rises a little over 10,000 feet above sea level with a distinctive and very steep 'bald' southeasterly face. This loop trail follows the rocky ridge known as The Devil's Backbone, rising up from Baldy Notch in the east all the way to the summit, before descending along the western perimeter of Baldy Bowl along the Baldy/Ski Hut Trail through San Antonio Canyon. 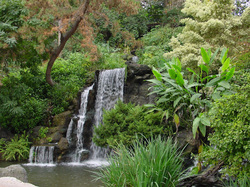 The hike also includes the picturesque San Antonio Falls near the trailhead. For novice hikers, families or those just seeking some easy solitude, this 30' two-tier waterfall may just be the answer you've been looking for. 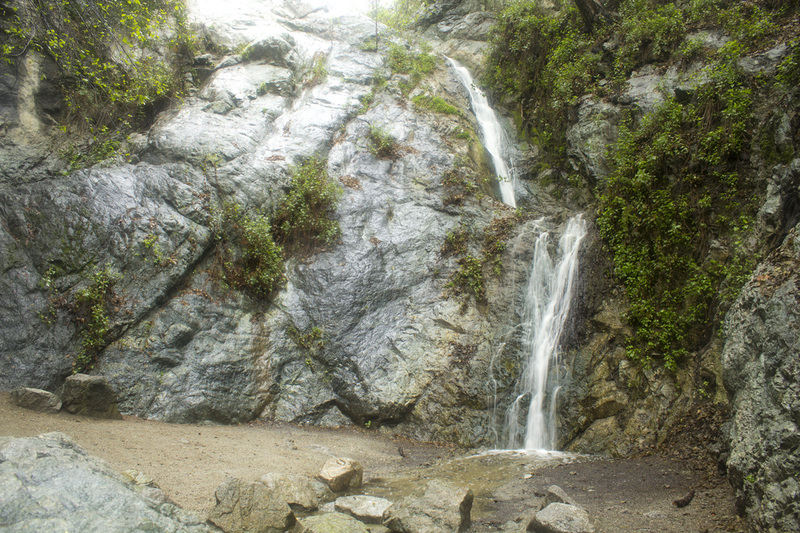 Nestled in the beautiful Monrovia Canyon Park, this waterfall has several different trails with a variety of features and vistas that end right at the base of the falls. The shortest hike is only .75 mile from the parking area at the Nature Center. The trail is relatively level and follows the small creek flowing from the waterfall. Due to an underground spring, the falls flow consistently throughout the year. The continual supply of water also makes for a lush, dense riparian environment with a thick overhanging canopy to provide plenty of shade. 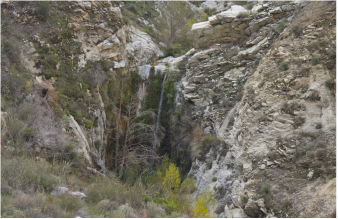 A moss-covered, horseshoe shaped cliff is home to this 40' cascade located on the western fringe of the San Gabriel Mountains. Though the trailhead is only about 30 minutes from North Hollywood, the secluded nature of this hike is evident well before you turn into the parking lot. The hike is an easy moderate with only about 700' in elevation spread out over two miles. The first leg of the journey is along a fire road that gives way to a single-track trail. The second part of the hike crosses and recrosses Golden Creek via footbridges and several easy fordings. The path along the creek is lush and provides a decent canopy most of the year. The last section climbs the canyon walls to the head of the waterfall with great views of the canyon below. The hike to Mount Lowe on the Sam Merrill Trail is daunting to say the least with a 4,000' climb to the summit spread out over 6.5 miles. Given the southern California heat and a trail with little to no shade, it's an intimidating prospect to say the least. If only there were another option to reach this historic summit with its grand vistas of the San Gabriel Mountains and the Los Angeles Basin. Well, as luck would have it, there is such a route and it comes with only a 400' gain in elevation plus stunning views of the San Gabriel Mountains starting right at the trailhead. Plus, you'll hike through the heart of San Gabriel Peak in the Mueller Tunnel and discover relics from Los Angeles' past scattered on the summit of Mount Lowe. 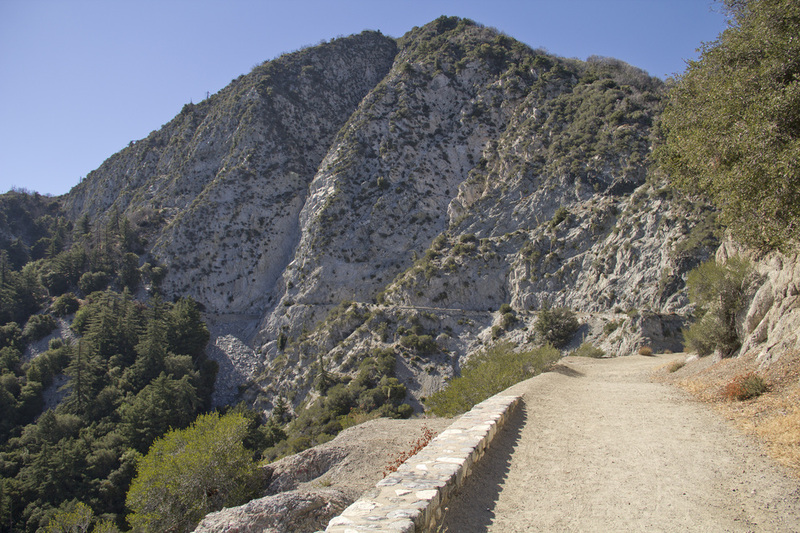 The Echo Mountain Trail is actually a combination of two trails, the Lower Sam Merrill Trail and the Mount Lowe Railway Trail. The trail winds 2.75 miles one-way along a system of switchbacks through the Las Flores Canyon, with a brief crossover to Rubio Canyon and along an upper ridge to the Echo Mountain promontory above Altadena, CA. The summit precipice is the site of the once resplendent Echo Mountain resort built by Professor Thaddeus Lowe. The resort was destroyed by fire in 1900 leaving the foundations and the station landing for the Echo Mountain Incline Railway and an Echo-phone where guests once listened to their voices bouncing across the canyons. The hike to San Gabriel Peak and Mt. Disappointment is perhaps one of the most perfect hikes in the Greater Los Angeles area. It offers the chance to bag two peaks on one hike, has incredible views, contains the ruins of a historic Nike Missile Base, passes through the heart of the mountain in the Mueller Tunnel and offers a hiking experience from an ultra easy walk to a challenging strenuous climb. The beauty on this hike is evident long before you exit your car at the Eaton Saddle Trailhead. And with 360° panoramic views from the summit, a trek to San Gabriel Peak at sunset offers some stunning views of the twinkling lights of the San Gabriel Valley, the Los Angeles Basin and the San Fernando Valley. Views to the east encompass Mt. Wilson stretch all the way to Mt. Baldy.